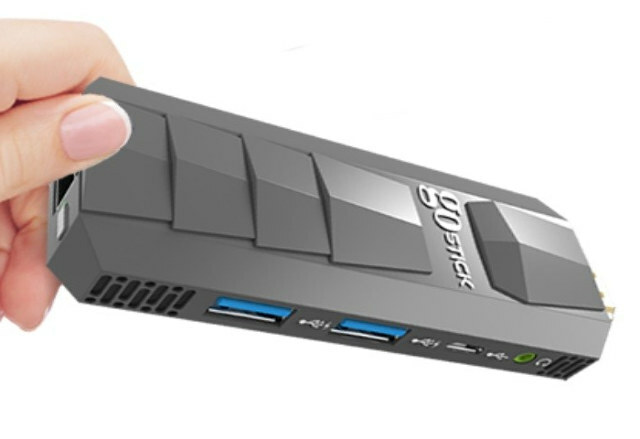 After products like MagicStick or MeegoPad T07, GOSTICK is yet another crowdfunding campaign for an Intel Atom Cherry Trail TV stick. The device does have some interesting specifications with an Intel Atom x7-Z8750 quad core processor, 4 to 8 GB RAM, and 64 to 128 eMMC flash. The stick all run Windows 10 Home 64-bit. The specifications are very attractive, but the Indiegogo campaign has at least two red flags: flexible funding, and only 3D renders are provided, without pictures of the actual prototype that is based on x7-Z8700 (since x7-Z8750 is barely available). However, they have uploaded a demo video that’s said to run on GOSTICK with 4GB RAM, 64GB Flash, showing Windows 10 Home Info (it’s activated in the demo), Microsoft Office, Adobe Photoshop CS6, and Blender 3D graphics and animation software. In case the project is indeed legit, pricing is quite attractive with GOSTICK Standard going for $169, and Enhanced and Extreme versions for respectively $199 and $219 with all three rewards including worldwide free shipping. There are quite a few similar projects (even with more modest specs) on indiegogo and other crowdfunding sites. The costs should be higher, but they aren’t. you can see this one will (likely) crash and burn by the small response to it. 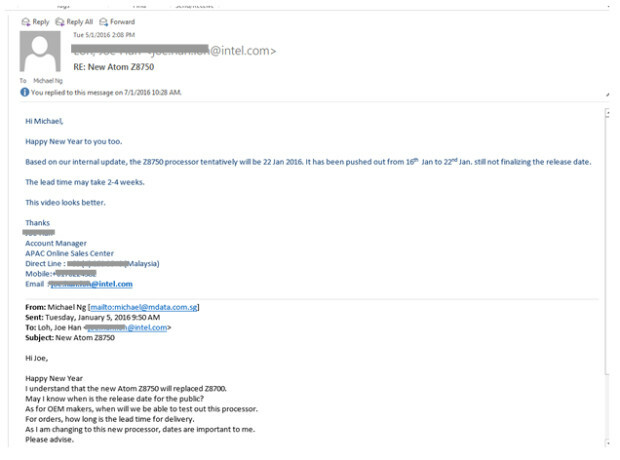 products listed in the “Products Affected/Intel Ordering Codes” table below. and Intel® Atom™ x5-Z8350), and Intel® HD Graphics 405 for 16EU SKU (Intel® Atom™ x7-Z8750). http://mdata.com.sg is the website, but it’s not finished by the looks of it. I missed it in the Indiegogo page yesterday, and Google did not know about it. I see Ubuntu logo on the indiegogo site so Linux support is there? Since it’s flexible campaign, will i loose my money if the goal isn’t reached? I would not trust that Ubuntu logo. About your money. It depends. If the company already has other orders and is only using Indiegogo to complement those, I guess they would still manufacture the devices if they got 10 backers, and send the product to you. If Indiegogo is their only plan, and they get 10 backers, I don’t think they’ll be able to go with mass production, and I’m not quite sure what happens with the money. They could probably refund it (minus Indiegogo fees? ), or simply disappear with your money. Seeing the info available on Indiegogo, I don’t see any hardware only 3D renders, as well as a Windows 10 demo on a machine with 4GB RAM, 64GB flash and an Intel Atom x5-Z8500 processors (which could be theirs or anything else). I’ve tested a similar Atom X5-Z8300 system and Ubuntu works on the latest daily builds, but it doesn’t work properly with any of the released versions. Note that there’s no official support from Intel, so there won’t be any official graphics drivers, but it’s possible it’s the same as some of their other drivers. Even things like audio and Bluetooth work? That’d be good. I haven’t tested that to be honest, but the audio chip is a standard Realtek thing, so it should work. The Wi-Fi/Bluetooth module is also Realtek, so I don’t see any reason why the Bluetooth shouldn’t work. I’ll have a look at it later. The VOYO V3 Windows looks promising…but we’re still not there yet. I want a Mini PC in the style of the Beelink BT3 with a x7-Z8700, Dual Band 802.11ac, BT 4, at least 2 USB Ports and Gigabit Ethernet. Trust me…that would just fly off the shelves. What I find interesting here is in the comparison with the Magicstick campaign, which was very poorly run, with so few real demos of the product that were also of rather poor quality, with quite high prices for the spec and yet it was oversubscribed. Here we seem, on the surface at least to have something superior in specs at a lower price and with some semblance of demonstration about the capabilities of the stick and yet the number of backers is virtually zero. The one thing that Go stick need to do is to show the actual stick used for their youtube demo to let people know that a physical product does actually exist. Atom X7 is ridiculously hot, it will be impossible to run inside such a small form factor unless they lower the clock or use active cooling, which is unlikely to happen. Where’s the mic jack for voice input? Please advise me on how could input voice using the GOSTICK device (Mini PC). Interesting GoStick product n it would be great if the mini gadgets that can have Excellent Sharpness Quality E.g DVD,Blu-Ray,4K Resolutions support > ***Built-in Recording Function n Play Back various types of Formats, Expanded Built-in-Storage Memory up to 1TB, 2TB, 3TB > various Models for individual consumer needs and to note affordable pricing …? SD Card Slot, USB Thump Drive input, Earphone/Speaker input, Audio Quality of 5.1 ,7.1 (DTES Enhanced Sound) AV-IN & AV-OUT input, FM Radio,Optical cable input, Wifi, Wireless,Remote Control…Etc External Lithium Battery Rechargeable that’s powerful n can last for at least 3-5days depending on the Usage Cos great for indoor & out-door Or Travel aboard. Thks in advance n wish U all the best Techno. ?G?.